"Pretty much everywhere, it’s gonna be hot"
sorry, I think this it totally lame! What? What it has to do with Haiti? And what with the hot everywhere? I think this few persons have smoked some strange funny cigarettes before the show Somehow their actions seem spliffed to the bones. 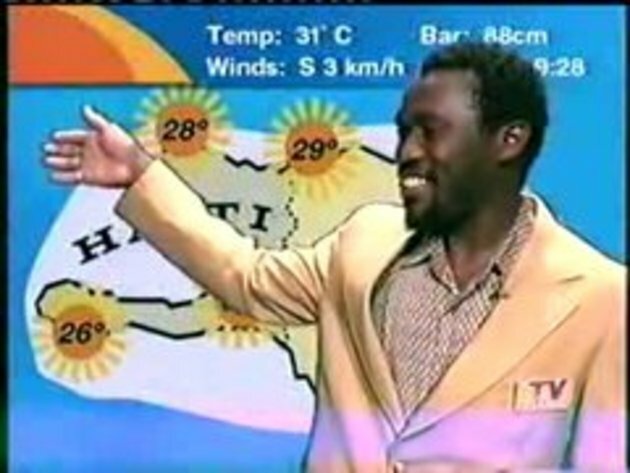 Right, what a stupid weatherman for a start,, then what is the woman doin talkin about her jacket, its 32 degrees everywhere and she's wearing a jacket and says she doesnt need to wear one but still doesnt take it off... then how stupid is the weatherman again, lordy lordy what is he laughin at?? who the f**k employed those people, and where is haiti?? is it a tiny island then where they all get battered on local green and break into studios and do the weather? #11 lol. My thoughts exactly. i agree with noobeater - scorchio!!! how funny yet sad in the way he is shown on Snotr for the world to see!!! i love his random laughter. They both look like they get stoned together on the weekends ! OMG HE REALLY IS STONED! What's up with that pause he makes before he starts laughing. Makes him look like a complete R-tard. "The best 9 seconds clip ever? You can watch this 100 times and keep laughing "
I just can't stop watching this! !